Our 300CP model of Trolley Lift is available in a 300kg Lift Capacity and is supplied as standard with a concertina lift shutter door. Serving at floor height, this trolley lift is very efficient at moving goods of upto 300kg between floor levels. Made from durable high strength steel, our 300CP model will be a reliable trolley lift for many years and ensure your heavy goods are moved safely. 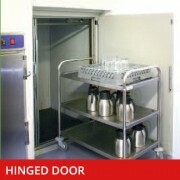 This lift is very popular and is found in many different working environments. Constructed in mild steel, finished in a tough grey baked enamel. Landing entrances are protected by a single hinged steel door with grey baked enamel finish as standard, or optional concertina shutter leaf gate with galvanised finish. 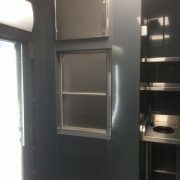 All doors are fitted to our structure and have safety locks to comply to safety regulations. 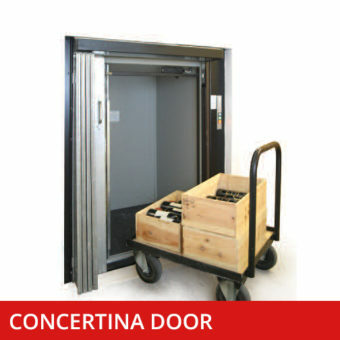 In order to meet the Essential Safety protection: Requirements (ESRs) of the Machinery (Safety) Regulations, the lift car should be supplied with car entrance protection. This protects goods from falling out of the lift car whilst it is in motion. In order to comply with the requirement a collapsible gate is fitted as standard. Up to three entrances can be fitted on each floor. Fully automatic push button control with call and send facilities at each landing entrance. “Lift arrival”, “lift occupied” and “lift position” indicators are fitted at each entrance for extra reassurance, together with an audible lift arrival buzzer. Up to 6 stops over a total distance of 18m of travel. The Trolleylift is supplied in a structure-supported frame. 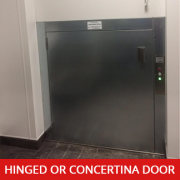 We do not require a separate motor room or “load-bearing” lift shaft. A solid base and support at each floor is all that is needed from your building. For details, please ask for our builders work details. Complies with the Essential Safety Requirements (ESRs) of the Machinery (Safety) Regulations 1992, also known as the Machinery Directive and EN 81-3 where applicable.